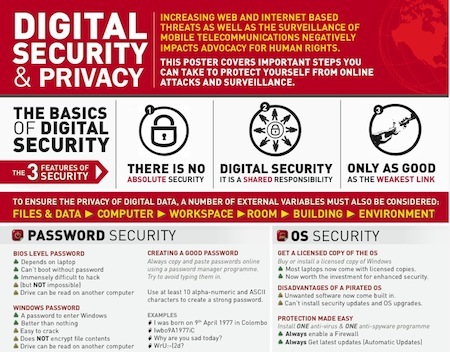 Following up the technical support and input provided by the Centre for Policy Alternatives and I to human rights defenders over a number of years in Sri Lanka, we decided to create a poster to help recall key aspects of online and mobile security. These high resolution posters are designed with Sri Lankan ground realities in mind, but are applicable in a wider context. At the time of writing, for example, these guidelines can assist those who wish to exchange sensitive information in Tunisia or Egypt. The poster labelled press contains crop marks and is for printing. The other is for screen/web use. Both PDFs have been optimised to the smallest possible file size for ease of download. The PDF is a standard poster size of 17″(w) x 22″(H) and can also be scaled to fit and printed on A2 with some white space around the edges. This can also be printed in A4. Colours have been carefully selected to look good in full-colour as well as in black and white if printed through a laserjet or inkjet. Since the poster scales down perfectly to A4, it is suitable for printing as an in-house workshop handout. The design and content of the poster follows the workshops and individual meetings CPA and I have had with leading HR defenders, with recommendations anchored to local realities, including the political context plus the level of technical know-how of activists and NGOs. It is not just a regurgitation of material available elsewhere online. Please distribute this amongst those you know who are at risk of web, Internet and / or mobile communications surveillance or have what can be perceived as sensitive information to communicate. Remember that these are only guidelines. As the poster also emphasises, there is no absolute guarantee of security online. One final point. That the means through which information and communications are made secure is publicly known does not make the exchange of information any less secure. Put another way, though many know Skype is the most used way to talk about and exchange information on sensitive topics, it is technically nigh impossible to tap into Skype. As we sadly know in Sri Lanka, the most used way to glean sensitive information or silence its producers is through physical means.